These two puukkos were crafted by Jani Ryynänen, residing in Kullaa and Pasi Jaakonaho, residing in Inari. 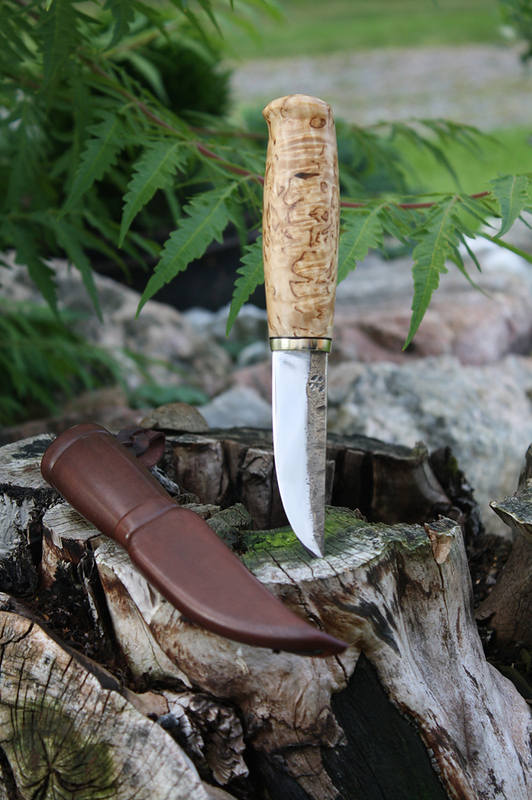 Ryynänen is a hobbyist maker, part of the newer generation of rising knifemakers whose work is current as well as utilitarian in style. 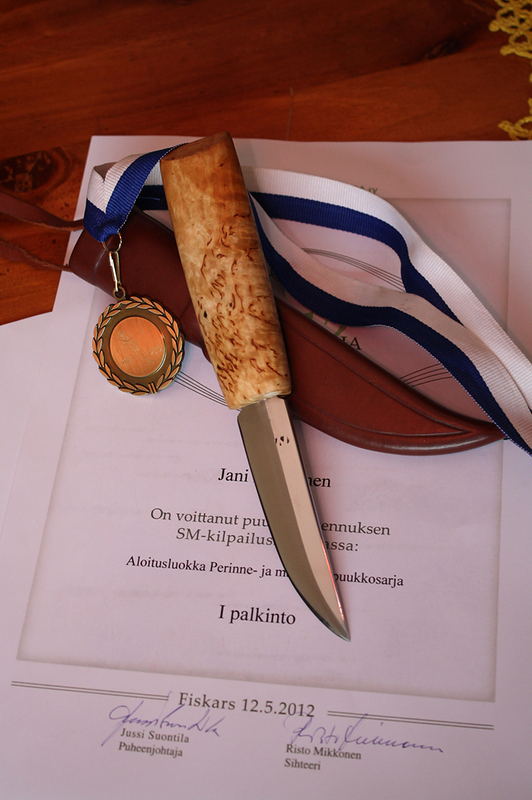 Jaakonaho is one of seven Finnish puukkoseppämestari or master bladesmiths. 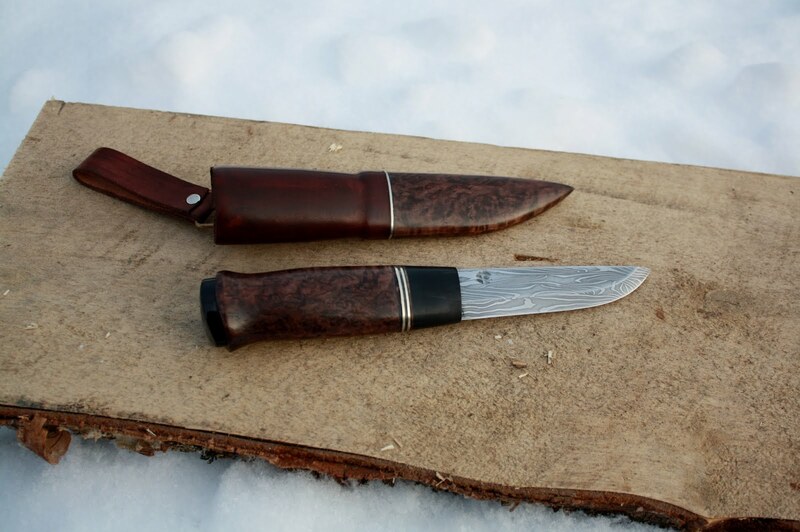 Being a teacher of Sámi crafts and devoting much time to the construction of silver jewelry and wooden artifacts, knife making is mostly a hobby for him as well. Both handles are fixed by tang peening and oven heating. The blade was forged with hand held hammer from a bar of 80CrV2. It has a rhombic section, slightly tapered in height. After annealing and normalization it was heated in the forge, quenched in oil and tempered in an electric oven. During the quenching the tang and the spine were kept off the oil so to make them softer than the edge. The bevels are brought to 20 °, polished by hand and the edge has a small micro bevel. 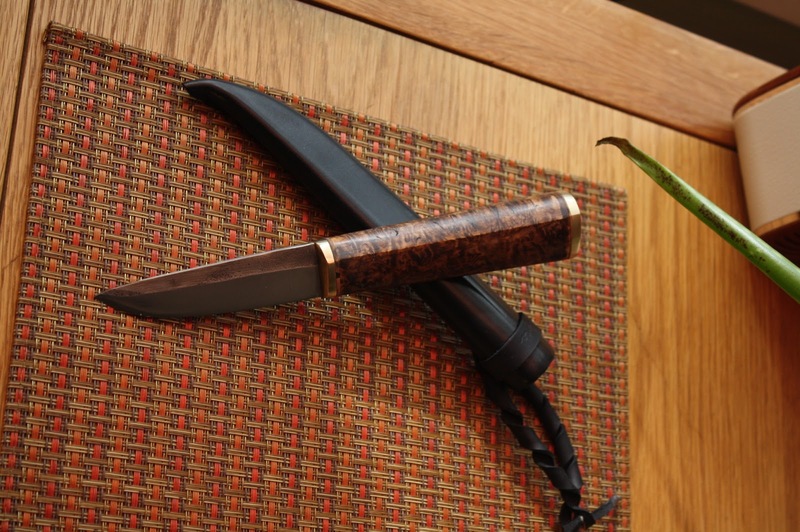 The handle is made of birch bark flaps compressed between two 5 mm brass plates. It’s sanded to a fine grit, it’s slightly tapered in height on both sides. The thickness, however, diminishes clearly from the center towards the blade. The section is almost oval in the first 2 cm near to the pommel and then gradually becomes a teardrop. 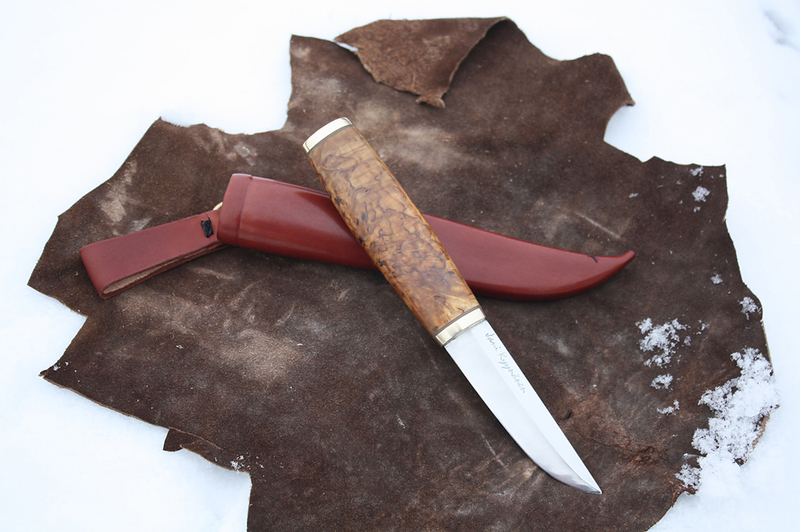 The 3 mm thick leather sheath, is hand sewn and holds the knife tightly. Inside there is a birch liner. 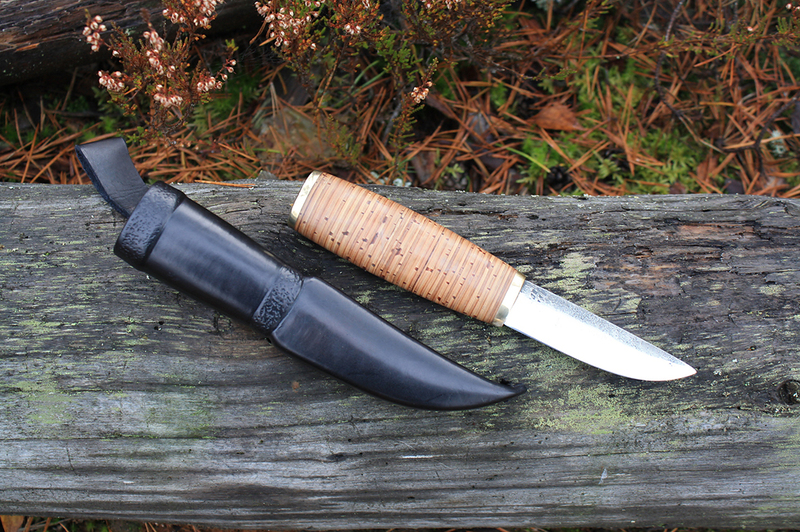 The belt loop is fixed with a brass ring which, compared to the triangular ones, slightly loses in stability of the sheath during the carrying, but without becoming boring. The loop itself it’s closed by a brass rivet. 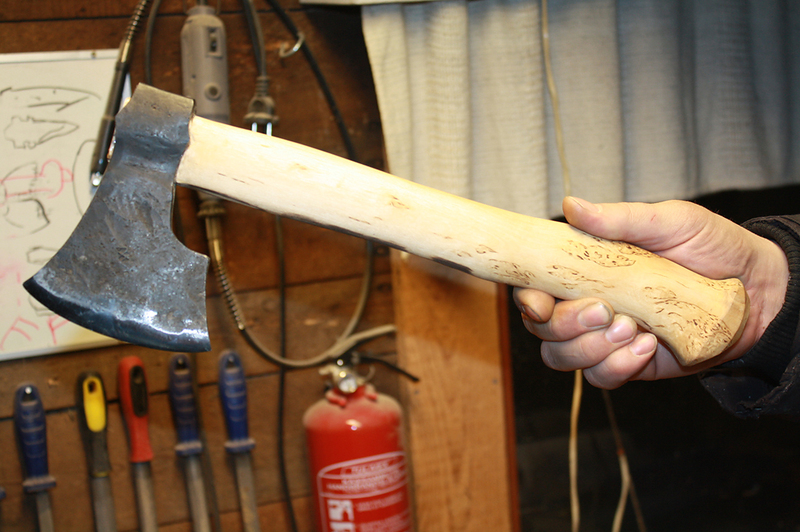 The blade was forged with hand held hammer from a bar of Böhler K510. It has rhombic section, slightly tapered in height. After annealing and normalization it was quenched in oil and tempered in an electric oven. During the quenching only the tang has been kept out from the oil, the blade is thus uniformly hardened on its entire height. The bevels are ground to 20 ° and polished by hand. The handle is made of birch bark flaps compressed between two brass plates, 3.5 mm the collar and 5 mm the pommel. 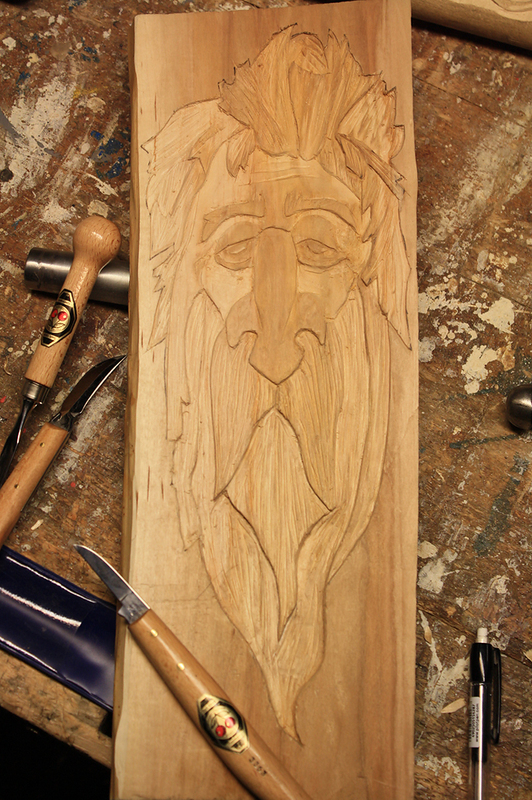 It’s sanded to a fine grit and has a hint of taper in width and thickness, in both directions. It has an acute teardrop section and its proportions are pretty slender and thin. 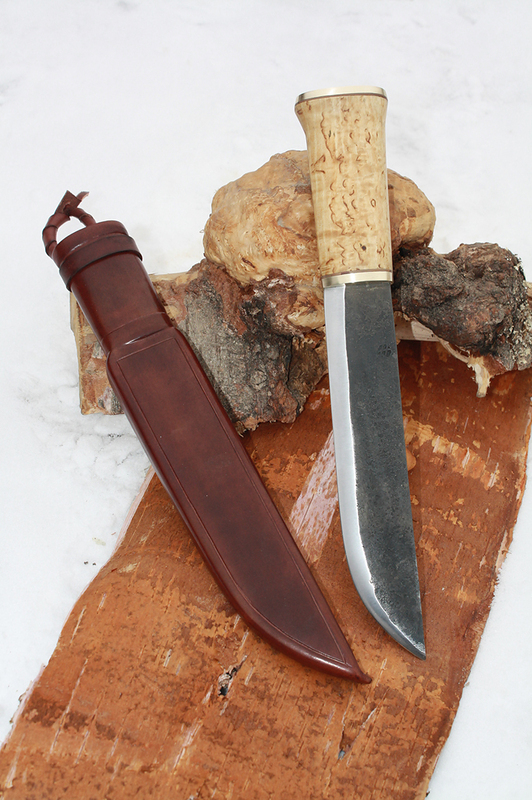 The half-tanned 1.5 mm thick leather sheath is hand sewn and holds tightly the knife. Inside there is a birch liner. The belt loop is fixed with a brass D ring so the knife is still very free to swing on a belt, a bit less than with a round ring, but still more than with a triangular ring. The loop itself is closed by a leather string. 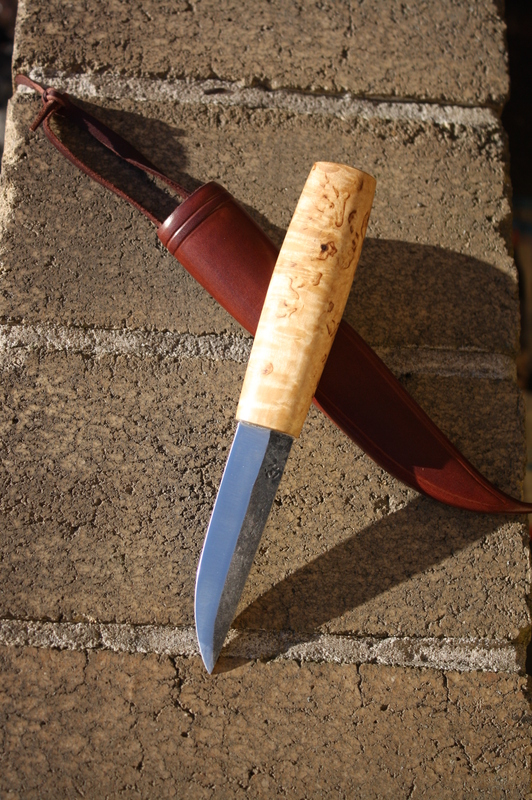 Out of the box the Ryynänen puukko was sharp, but not perfectly shaving sharp. I then touched it up with DMT 1200/8000 and stropped with Bark River black and green compound. In ten minutes it was hair popping sharp. The handle, in spite of being stocky, responds well and I didn’t felt it “stiff” due to the greatly executed gradual section transition. The first thing that struck me in the Jaakonaho was the handle, much shorter, thinner and with a much stronger section compared to what I am used to. After an hour of carving on elderberry, just to get familiar with it I found some microchips near the front bolster and on the edge belly. They were reduced with a couple of minutes of stropping with green compound, thus adding also a hair of micro bevel. During the carving of the elderberry spikkentroll, the Ryynänen showed good bite and penetration. However, because of the blade wide proportions, I felt like if it was slightly suffering during the pull cuts during the first phase of finishing. Comfortable handle, nothing to report. At the end of the work the blade had a few rolls in the central part of the edge and shaved with some effort. During the spikkentroll carving the Jaakonaho has been very aggressive and at times the penetration was such as to get the blade slightly stuck. During the roughing cuts I felt the handle a tad small. At the end of the work the blade had lost some bite, still shaved but with some effort. 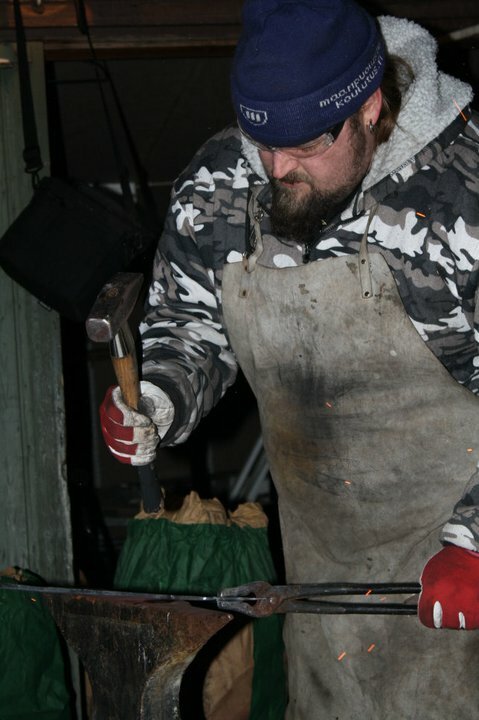 During the carving of the silver fir spatula, on the other hand, the Ryynänen proved itself more agile than what I expected and a very balanced performer, with good bite, good nimbleness and accuracy both during roughing and finishing. 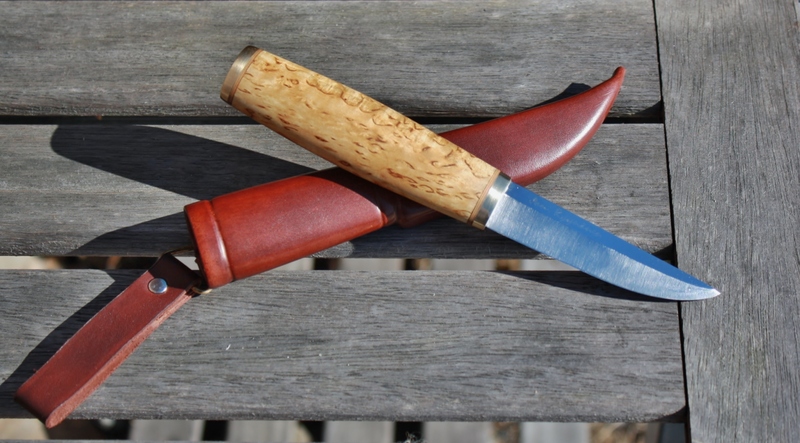 I perceived no bite loss during use, it always was easy to achieve tiny tight curls and the knife has always left a glossy finish on the wood. At the end of the work I detected three microrolls at the center of the edge and only its curved section was still shaving. The flat section didn’t shave anymore, but was still biting. During the carving of the spatula, the small measures of Jaakonaho’s handle were much more perceivable, but without being insufficient, conveying the feeling of a minute but very lively knife. The blade, on the other hand, got often stuck during roughing cuts due to its own thickness and bite, making the work more strenuous. During the finishing cuts, though, it showed all its potential allowing great working speed, creating extremely fine curls and leaving a high gloss finish on the wood. I perceived no bite loss. After the work I found some rolls along the edge, which still shaves but with some effort. The Ryynänen, showed very homogeneous performance, being more comfortable on medium sized jobs. Its proportions and dimensions are a bit over sized for very small projects, but given the agility demonstrated it’s easy to get used to. Its very size makes it probably more appreciable by those with large hands. The steel tends to roll rather than chip. 80CrV2 at 60 HRC doesn’t have an exceptionally long edge holding, but still plenty enough, gaining in resilience and ease of sharpening. The Jaakonaho has instead proved to prefer smaller jobs. Not surprisingly its proportions makes it preferable to those with small hands. The handle, although thinner and shorter than what I’m used to, was never uncomfortable, but its small size were absolutely perceptible. The blade, combining great thickness with a very acute edge often acts like a wedge, thus tending to get stuck. A thickness closer to or slightly less than 5 mm would have been probably better. The steel tends to microchip more often than rolling, has a bit superior edge holding compared to 80CrV2, and still resharpen easily.